IABNZ’s Internet Advertising Revenue Report for Q2 2018 was released today with total revenue reaching $255.4m for the quarter, representing 15% year-on-year growth. With a total of $500m for H1, 2018 is looking like a record year. A survey is conducted independently by Staples Rodway on behalf of IABNZ each quarter. The results reported are considered the most accurate measurement of online advertising revenues, since the data is compiled directly from information supplied by companies selling advertising online. All-inclusive, the report includes data reflecting online advertising revenues from 16 New Zealand online publishers across their websites and commercial online services. 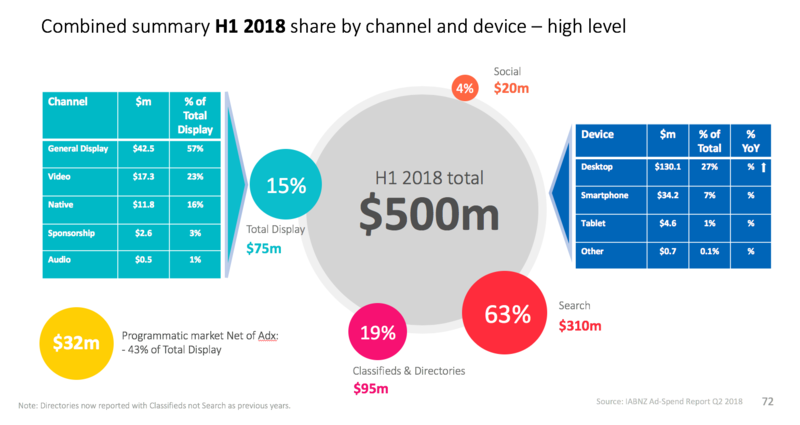 The total of mobile devices (smartphone, tablet and other) generated $19.5m, 8% of revenue across these three channels and achieved 37% year-on-year growth whilst desktop display revenue generated $67.3m (26%) of the grand total. Classifieds and Directories are the largest channel on desktop, and generated $48.2m (19%) of the grand total. Smartphone revenue reached $17m or 6% of total revenue and 39% year-on-year growth. The Smartphone revenue reported reflects revenue generated by NZ publishers and is net of Search and Social. 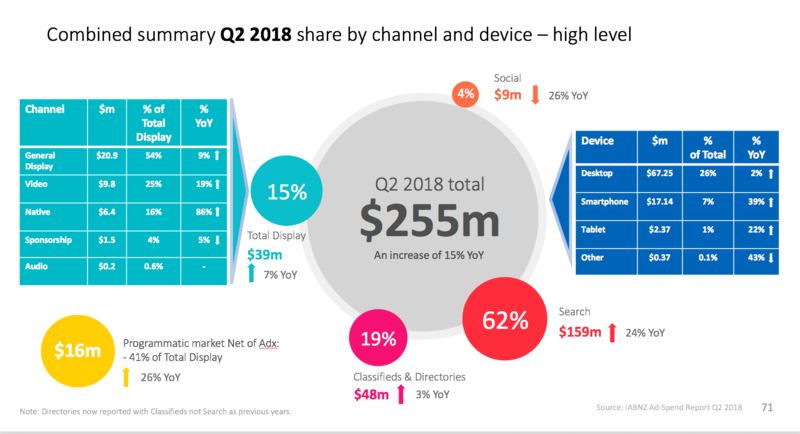 Across all devices, total Display advertising revenue reached $39m with General Display advertising reaching $20m, a 9% year-on-year decrease. Video generated just short of $10m over the period, a 19% year-on-year increase. Sponsorship made up 4% ($1.6m) of the display category, up 1%, whilst Native contributed $6.4m to the Display total, up 86% year-on-year. Programmatic Revenue, which IABNZ sources from Standard Media Index (SMI) and is agency spend only, realised $16m in Q2 (41% of total Display revenue and net of Google Ad Exchange). The Association of National Advertisers (ANA) in the US estimates that around 40% of revenue booked programmatically is finally attributed to media owners. Using this benchmark some $6.4m of programmatic spend can be attributed to NZ publishers. The Search category topped $159m in the quarter and now forms 62% of total revenue. Social media revenue which is also sourced from SMI captured by NZ media agencies reached $9m in Q2 (4% of total revenue). With a 24% decrease year-on-year the data suggest that there is a move away from agency bookings of Social media to direct buying. The IABNZ Revenue report is formatted by Device and Channel. The report filters revenue by device-type, that is, by mobile, desktop and tablet. An ‘Other’ category has also been included to capture revenue associated with smart TV apps, gaming consoles, wearables etc. Each device-category is broken down into channels including general display; video, audio; sponsorship and native. Programmatic Advertising revenue figures are now sourced from Standard Media Index (SMI). The reported revenue reflects the value of actual placements as reported by Agency Trading Desk bookings and bookings onto independent DSPs. The number reported is net of Google Ad Exchange. Social Media and Search collection methodologies remain unchanged to last year. These figures are not included in the device and channel analysis. Interactive Advertising is advertising viewed on a desktop PC, laptop or mobile device and accessed via an internet connection, 3G, 4G or WiFi. The Advertising Standards Authority (ASA) today reported that advertising revenue across all main media was 2.561 billion dollars for the 12 months ended 31 December 2017. The 2016 total was 2.572 billion dollars.